The issue of health and development of modern and sustainable health systems has recently gained greater importance and attention in many developing countries as a major driver of socio-economic progress where more resources have been invested in this sector than ever being before. Today, people are healthier, wealthier and live longer than 30 years ago. However, while the progress achieved over the years in health sector has remained highly concentrated in the developed countries, many developing and least-developed countries are still seriously lagging behind. This is particularly true in the regions of South Asia and Sub-Saharan Africa where health care coverage and health services remained significantly poor in many countries including most of OIC Member Countries in these regions. While progress in achieving universal health care coverage remained highly uneven in OIC Member Countries, the averages of the major health indicators in the OIC Member Countries as a group are still lagging behind the world average and the averages maintained by the group of the developing countries. The health care system in many OIC Member Countries is still seriously suffering from various problems and challenges related to ensuring adequate financing resources, infrastructure, workforce and health regulations. 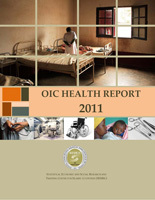 The OIC Health Report 2011 provides an overall assessment of the current state of health situation and health care coverage in OIC Member countries. It provides a detailed analysis of the trends on major health indicators in the OIC Member Countries at the average OIC group level as well as at the individual country and OIC sub-regional levels. The Report also highlights some health related issues in these countries such as health expenditures, the using of Information and Communication Technology (ICT) in health sector “e-Health” and the OIC cooperation efforts and initiatives in the domain of health. The Report ends in the last section with a set of broad policy recommendations related, in particular, to health financing, preparing health workforce, improving health services infrastructures, health reforms and complying with international health regulations.